The Simpsons episode aired in the US. I watched it with my daughter Maddy, her friends, and some of my friends. We had doughnuts (all kinds, but mostly the kind with sprinkles on them) and snacks and made it a proper TV watching party (I've always wanted to have one of those, but somehow never had before). I hadn't told the girls anything about the episode so the final twists and turns of the plot (which I am not telling here, because many of you haven't seen it yet) took them by surprise. When the episode was done, the girls went into the kitchen and giggled a lot, while Bill Stiteler and I watched the episode again, this time with the freeze frame on, to catch the many book title jokes hidden in the episode. The reviews for it have been wonderful, which is a testament to Exec Producer Matt Selman, writer Dan Vebber, and the crew of staff writers. And in some alternate universe where all the pink people are yellow, I like to think there's a version of me still sipping his drink on the beach at Shelbyville. 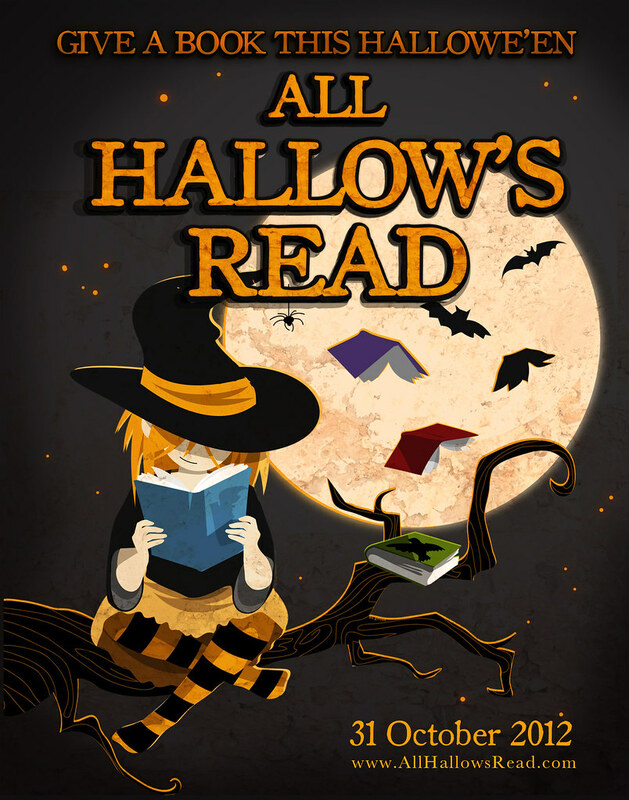 The contest is to design posters promoting All Hallow's Read. 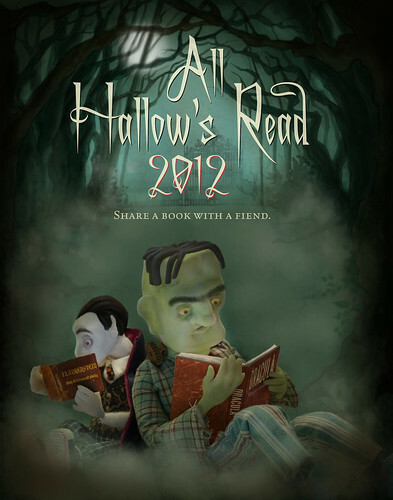 The winning poster design will become a limited-edition poster to be printed and distributed to participating booksellers for All Hallow’s Read in 2012 (printing and distribution sponsored by HarperCollinsPublishers). In addition to her poster being printed and distributed to book stores in 2012, the Grand Prize Winner will receive a signed copy of the limited edition poster and a “Neil Gaiman Prize Pack.” The prize pack will include a signed first edition of THE GRAVEYARD BOOK, a copy of CORALINE, and a copy of the CORALINE graphic novel. First place winners will both receive the prize pack. My congratulations to all the winners, and, more than that, my congratulations to everyone who took part. The posters submitted (you can see them up at http://www.flickr.com/photos/webgoblin/favorites/?view=lg -- go and look) are pretty much all wonderful. I was glad I wasn't judging the competition. I hope that people will use (link to, spread around) all of the posters people did next October -- they really are fantastic. I learned last night that Anne McCaffrey had passed away. I met Anne for the first time as a teenager, in bed with glandular fever. A friend came over with a pile of books, because I could do nothing but read, and in the pile were books by Anne McCaffrey. I read the Dragonflight books, and The Ship Who Sang, and loved them. I met her as a person in the late 80s, when I was a young writer, at a convention, where she was the Guest of Honour. It was a small convention, and she decided that I needed to be taken under her wing and given advice I would need in later life, which she proceeded to do. It was all good advice: how to survive American signing tours was the bit that stuck the most (she wanted me to move to Ireland, and I came close). I already liked her as a writer, and by the end of that convention I adored her as a person. Over the years I'd get occasional emails or messages from her, and they were always things where she was looking out for me -- letting me know about a foreign publisher who had money for me but no address to send it to, that kind of thing. The last time I saw her was in 2005, when I was toastmaster at the Nebula Awards. I was as happy to see her as she was to see me.